Thai curry paste contains a bunch of ingredients including: chilies, garlic, shallots, lemongrass, ginger, galangal, coriander root, etc. Red curries are made with red chilies, green curries are made with green chilies, and yellow curry are includes spices like turmeric and cumin. Although it seems counterintuitive, green curries are actually hotter than red curries. For convenience sake, I use a store-bought curry paste (Mae Ploy brand) because it's a lot of trouble making your own curry paste since some of the ingredients are difficult to find. Using a premade paste cuts down the ingredient list by half and makes things a whole lot easier. I like using dark meat so I can slowly simmer the curry without overcooking the chicken. The end result is delicious, flavorful, and reheats beautifully, in fact, it tastes even better the next day. Optional step: Use a large cleaver and cut the chicken drumsticks in half, first cut through the flesh to the bone, then try your best to hit that spot with a strong whack. Sometimes you won't hit the first cut you made spot on, but it will be enough to break the bone. If you don't feel comfortable doing this, skip this step. Please don't hurt yourself doing this. After cutting the drumsticks in half, rinse the exposed bone area under some running water to loosen any bone shards. Do this over a sieve to catch the bone shards so they don't mess up your disposal. This step is completely optional, I just think it makes the curry more presentable and easier to eat. Do not shake the can of coconut milk. Open the can and skim off the "cream" on top (roughly the top 1/3 of the can) and add it to a Dutch oven or large pan. The first step is to "fry" the curry paste in the coconut cream. Add the paste to the coconut cream in the pan, stir and cook this over medium heat until the oils separate from the paste. First, the mixture will look soupy and very messy. Slowly, it will begin to cook down into a thick paste, then finally the aromatic oils will begin to separate from the paste. After you see the oil, add the chopped onion and cook the onion for about 1 minute. Add the chicken and the remainder of the can of coconut milk. Bring this to a boil then lower to a bare simmer. Season with fish sauce to taste, a tablespoon at a time. Add a tablespoon of brown sugar. Cover the pot and simmer gently for about 40 min to an hour, or until the chicken is tender (the meat will start to retract from the bone). When the chicken has finished cooking, stir in the juice of half a lime to start with, taste, and if it needs more tang, add more lime juice. If you don't have a lime you can use rice vinegar. Add more brown sugar if it needs more sweetness (the sweetness should be subtle and not overwhelming). Stir in a big handful of Thai basil leaves that are torn in half. It's important to balance the salty, sour, sweet, and spicy with Thai food. Don't tear the leaves in advance or they will turn black. That's a wonderful looking curry. I like both Indian and Thai curries a lot. i love thai curry! this dish looks yummy!! I always keep both red and green Thai curry pastes in my pantry, too. Makes it so easy to get a delicious curry on the table in a hurry! I've been wanting to try more curry dishes. Thanks for the great recipe! Great looking curry. I have tried the Mae Ploy red curry paste for a seafood curry and it turned out really good! I was wondering if you could help with recipes that uses Xue Cai? How do you prepare the vegetable before cooking? The ones I bought came in vacuum pack plastic bag. Can we use it straight from the pack or do we need to wash/soak them in water first? I love a good Thai curry. Yay! This looks fabulous!! Thai curries are so simple and so tasty! I'm with Stevens' prior notion on curry, however, if coconut milk can change his opinion, this recipe is one worth trying. Assuming maybe I can substitute chicken thighs for the legs? And where would I find Thai basil?? This looks so yummy I want to try to make it! I make your mapo tofu all the time. Thank you so much for that recipe. I've been wanting to try thai chicken curry for a long time and now I will follow your recipe again - you are such an inspiration! Me too, I love Indian curries as well. Definitely! Curry paste is such a timesaver. Sorry about the late reply. Xue cai might be xue li hong, and sounds like a salted preserved veggie. I would just take it out of the bag and rinse it well, chop and use it. If it's too salty you may need to soak it in some water next time, so try just using a small amount at first to see how salty it is. Yup you can substitute thighs for the drumsticks. You can use skinless thighs to cut down on the fat. If whole thighs are too large, grocery stores sometimes sell boneless skinless chicken thighs, which are much easier to cut into smaller pieces. I buy my thai basil at a local Asian grocery store but I've seen it at local farmers' markets also. It has a purple stem with pointy leaves (as opposed to the rounder fatter leaves of sweet basil) and it has a sharper, almost minty, aroma. yum! and so simple. i love thai curries. This weekend I gave this recipe a try and found it to be quite tasteful. Next time I hear someone mention they aren't a fan of curry, I'll recommend this one! I love red curry from Thailand. Your dish looks great! At what point does the brown sugar go in? It's in the recipe list and never used in the instructions!! I made it with chicken breast and without the brown sugar obviously........tasted great! Hello, nice blog. I just read your recipe and visited your blog for the first time today. 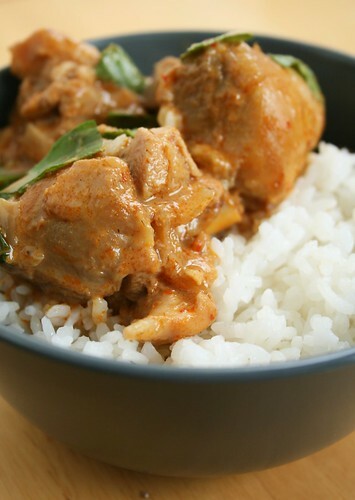 I just posted an entry on my blog about chicken curry with a yogurt sauce. Come by and check it out if you can and let me know what you think.